India often gets a bad press, economically, politically, touristically and even in contemporary literature for reasons I won't repeat here as it's mostly undeserved: it's a fully-fledged democracy, the globe's largest, so the world feels entitled to snipe at it in a way it won't at two other giants I can think of to its north and east that aren't and, in our lifetime, probably never will be. It's a land both fabulously endowed and desperately poor and with a population approaching 1.3bn souls, about 1000 of them to every square mile of the Subcontinent, stark contrasts are inevitable, its infrastructure bound to creak, the way Indonesia's does with only one-fifth India's population and with vast, if unequally distributed, wealth in and on the ground of it's 17,500 islands, each inhabitant having eight times the breathing space of his Indian counterpart although not everyone on either Subcontinent or Archipelago breathes too easily as industrialisation and land clearance invariably fog their existence and congest their lungs. Indian state tourism has billed its host as Incredible India! Without any doubt whatever, it is. I've been just as incredibly fortunate over the last six decades and more to progress from Kipling's tales and Forster's - and a series of ever-improving atlases that triggered dreams of exotic travel - to the real thing and while the imagination can and usually does run riot on the page, India actually runs amok through the senses once you get there. Up-close, a gallery of faces that have life and history etched into them like the most detailed relief map in my best atlas; years of potential and ever-changing subject for a photographer with time on his or her hands, where a fortune lies in the residual experience of seeing and sharing and never in the selling. It's wonderful how easily people smile here. Fairy tales abound in India, except that they're probably nearer the truth than the legend, the stunning architecture of their settings proof positive of that. One of the world's Seven Wonders, perhaps even more of love than of the sheer brilliance employed in putting together brick, semi-precious and common stones, white marble, clay, gum, limestone and glass to such stunning effect, Agra's Taj Mahal is Mughal emperor Shah Jahan's monument - and 22-year-long labour of love - to his beloved Persian princess Mumtaz, deceased in presenting him with their fourteenth child. It's doubtless the world's finest monument: no matter how many times one visits, even in a single day, its position and the chameleon-like way in which it both absorbs and reflects light is surely the Eighth Wonder. It's not entirely clear who was responsible for the mausoleum's design, and its scale suggests that it might have been a team effort, but the emperor was likely consulted throughout, the Persian influence noted. It's even rumoured that the artists had their hands cut off on completion to ensure that the monument would remain unique, but maybe that one's for the fairies. Be amazed as its dome suddenly floats out from and above the Yamuna's sunrise mists, the image burning itself into your retina, still there years after it's disappeared from your card or emulsion; regret it's disappearance into the blues, pinks and purples of twilight as it's put to bed at the end of another magical day. A week on site probably wouldn't do it justice and one should never object to the tug at the sleeve in the monument's compound from a wizened local who points to a precise spot on the pavement that will give a perfect framing of the Wonder. They love their Taj! One thousand labourers and artisans toiled for every year of its construction, 22,000 in all, one thousand working elephants treading its grounds by way of construction plant to ensure that the Emperor and his Princess had a fitting, final resting place. I guess we can only be thankful to British Viceroy Lord Curzon that after 1857's Indian rebellion and the military excesses that followed it, with their attendant pilferage of precious materials and stones, a comprehensive restoration project was undertaken and completed, with the outline of today's landscaping added at the time. But maybe I should explain why we were in India in the first place: by kind invitation to attend a wedding in Udaipur, City of Lakes, where our week-long fairytale started. Historical capital of the kingdom of Mewar and some 400km from Rajasthan's state capital of Jaipur, Udaipur, founded in 1553 by Maharana Udai Singh II, is also known as the 'Venice of the East', symbolically ruled today by the current Maharana Mahendra Singh Mewar; a real joy to listen to when acting as a 'guide' to his kingdom, looking and sounding every inch what he still effectively is: its King. Both city and lake are dominated by a series of buildings collectively known as The City Palace, on the east bank of the 4km-long Lake Pichola, an imposing fortress-like bastion with a commanding view of lakes, hills and subsidiary palaces, among them the Lake Palace on Jag Niwas Island, formerly the Maharana's Summer Palace and now nothing short of an illusion where we were fortunate enough to stay for the few days of the wedding celebrations. 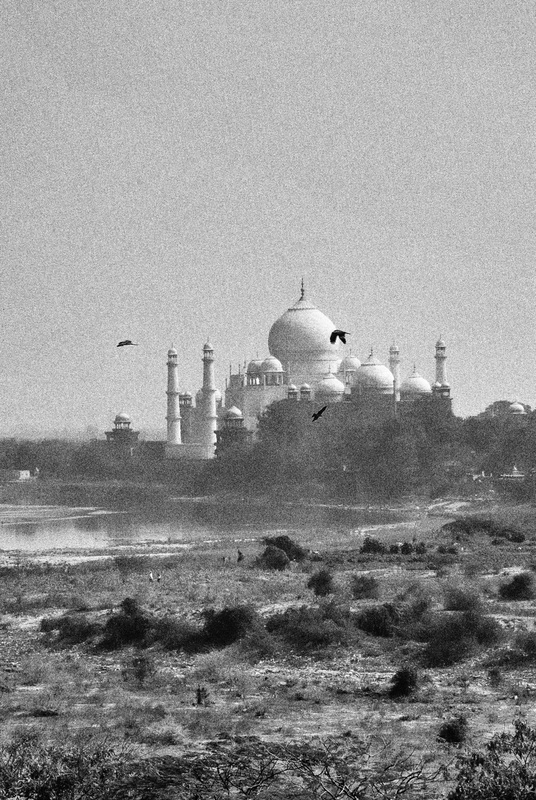 Beyond it, Jag Mandir occupying its own island and one time refuge of the Taj Mahal's Shah Jahan, famous for its garden courtyard and venue for the wedding and its reception. And then, perched atop what looks like the surrounding area's highest peak at 944m and built in 1884, the Monsoon Palace now affords panoramic views of this part of the Mewar kingdom and a peek across the ranges into distant Pakistan, but was originally built to observe the monsoon clouds, which might indicate when the rains would come, and to collect drinking water the year-round. As is usual on checking into a hotel room these days, the ubiquitous wide-screen TV monitor greets arrivals with a menu offering a range of facilities and options; rather than a hasty search for the remote control to switch off a nuisance, we left ours on, on channel one and on a constantly repeating basis over the next few days, to the exclusion of all other entertainments, for its mesmerising history of Rajasthan, its palaces and their inhabitants, most charmingly presented by the hypnotic voice of 'the desert wind' that's been blowing, often very intimately, over, into and across Rajasthan's history for some hundreds of years. The incumbent Maharana's input just added to the overall enjoyment and we were fortunate on departure to be presented with a copy of the film and its commentary by an ever-attentive staff who provided unobtrusive and impeccable service throughout our stay. I won't spoil the wedding celebrations by trying to describe them here as the following Galleries will surely do them a little more justice, when they're finally posted, and with the exception of the last Image on this page, have purposely employed black & white images for this introduction in order NOT to detract from the joyous colour of the Indian experience, which can hardly be bettered anywhere on this earth. India's capital, Delhi, is something else again and one can only wonder at how a city which should be terminally gridlocked daily extricates itself from its problems: I'm convinced it's because of the envious and endless patience of the Indian people to resolve problems without huge fuss or challenge to blood pressure and the nervous system: where there's a will, there's always a way and we can only learn from them. No doubt, it's disconcerting when it seems that your taxi is on an inevitable collision course with the nearest vehicle, auto rickshaw, indifferent, languid cow or pack of dozing dogs turning the highway's overtaking lane into an afternoon lounge, but somehow every millimetre ultimately counts and impact is usually avoided, although a closer look at bumpers, bodywork and one-dimensional clumps of assorted furs ironed into the tarmac possibly indicate that near-misses are not always so. The city now has a very efficient metro system that's being constantly expanded and its Edwin Lutyens/Herbert Baker grand-scale planning in the central area of New Delhi impresses to this day. Of course there are bad roads and there are even worse roads, like anywhere else in the world, but take a ride along the six-lane Yamuna Expressway from Delhi to Agra, completed in 2012, and you'd be pushed to find a better, smoother highway anywhere. Once Delhi's environs are left behind, so are the tumultuous crowds and congestion, the expressway almost empty, the flat plain left and right full of grain fields and brick kilns, with their signature chimney stacks the only punctuation on the 165km journey, evidence of humanity sparse away from the immediate vicinity of the clay pits, the occasional flock of sheep or goats the only visible distraction in what's often a decidedly pastoral landscape. I dedicate the following Galleries to bride and groom Sameera and Shubir and their respective families - with thanks for those dream-like days in Udaipur - and also to my own wife: Princess and travelling companion without equal; with an additional nod to Nikon, Panasonic, Fuji and Sony for downsizing and making light and a special one to Walimex, but particularly to Olympus and its tiny but magnificent Zuiko lenses, for together helping to make and take every image here and which fitted comfortably, ALL of them at the same time, into a Case Logic mini backpack that my spine had absolutely no complaints about. And to India, without exception, for its kindness, dignity and culture. One can't do in a week what deserves twelve months and more and as the focus of this journey was not primarily a photographic one: there was no tripod, no flash; no filters, no array of lenses, so what you see is more a record of a memorable experience, to share with family and friends, rather than technical or artistic endeavour, which I'm not really capable of anyway. The Incredible! refers to India and the Wedding both. Wedding photography is a highly specialised art best left to professionals, who did a great job; I recorded a little from the sidelines, hopefully unobtrusively. How does one photograph a fairytale anyway? We wish its subject Prince and Princess a long, happy and fulfilled life together.